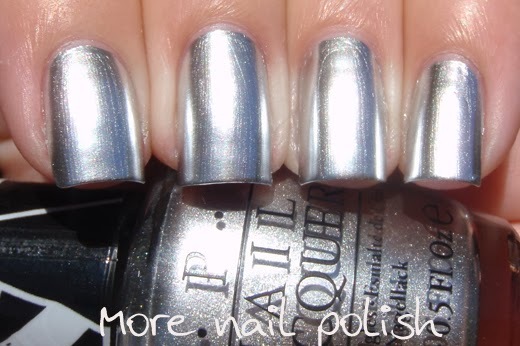 A few weeks ago I shared with you some swatches from the new OPI Gwen Stafani collection. I commented at the time that I was really looking forward to seeing Push and Shove, the mirror chrome, and seeing how mirror like it is. So you can imagine my excitement when this bottle arrived at my door on Friday! First, a quick swatch to whet your appetite. Here is the little Duet Pack. Push and Shove comes in the full 15ml size and the companion polish, called Lay Down that Base is in a mini 3.75ml bottle. The instructions say to put the base on and ensure it is totally dry before applying two thin coats of Push and Shove. Now some more photos. 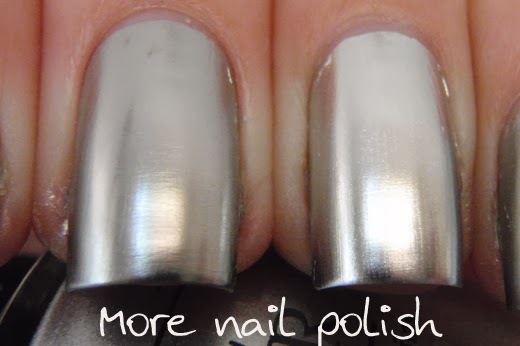 Application seems a bit tricky in that you should try to avoid wiping over where you have already painted and it looks brush strokey, but as the polish dries the chrome finish appears and your mistakes in applying the polish seem to disappear. Even when I painted over one spot twice, and the polish dragged and lumped a bit, it still dried to a perfect finish. In the full sun you can see the tiniest bit of a brush stroke, but in all other lighting conditions it pretty much appears flawless and smooth - well that is as flawless as your own nails are. 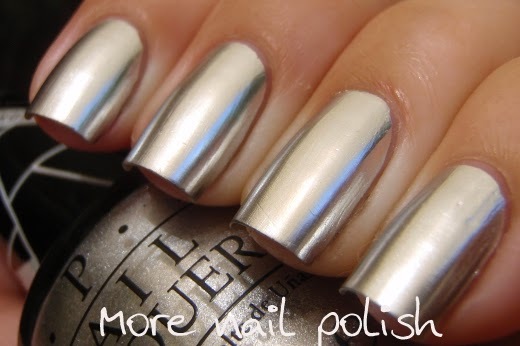 As a chrome polish it's going to highlight and accentuate every single lump, bump, dent and scratch on your nails. I gave my nails a light buff and shine before applying the base coat to get the best mirror finish I could. The base coat was good, but it doesn't seem to be like an aqua base or anything. I actually did reapply the polish today without the base coat to see how it would go when I run out of that mini bottle, and I was surprised to see that application was still pretty good, although I'm guessing it wouldn't last on the nail as long. So far I've only wore this for about 16 hours, so I can't really comment on wear. 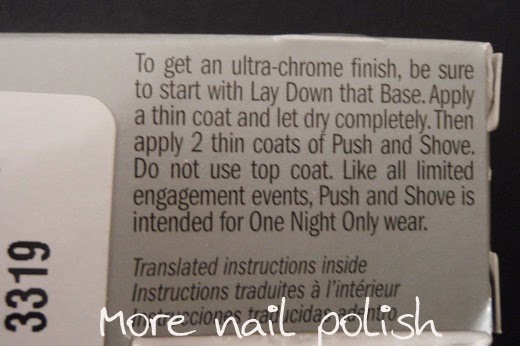 Although it should be noted that the packaging says that the polish is design for One Night Only wear. Considering that, this polish is standing up really well, I don't have any major chips, just some tip wear. I think it wears better than Layla Mirror Chromes. The packing also says not to wear top coat, but if you are like me, as soon as you read that it says not to do something, you have to do it. I tested out three different top coats to see if it effected the finish. I remember that the Layla Mirror Chromes are defiantly dulled by top coat. This next photo shows Seche Vite on the index finger, no top coat on the middle finger, Picture Polish Revolution on the ring finger and Essence Gel Look top coat on the pinky. I was unable to see a difference in the finish after the top coats had dried. 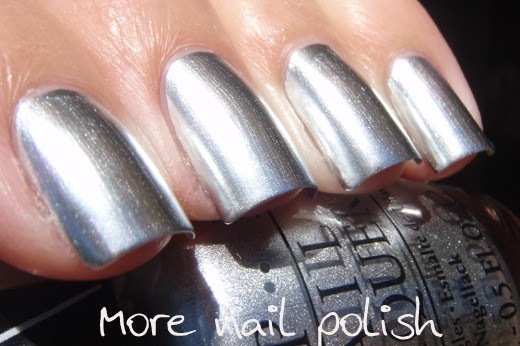 Next I did some comparisons to Layla Metal Chrome. In these photos the OPI is on the index and ring and the Layla is on the Middle and pinky. As you see, there is the slightest colour difference in the polishes, with the OPI being a brighter and cleaner silver. 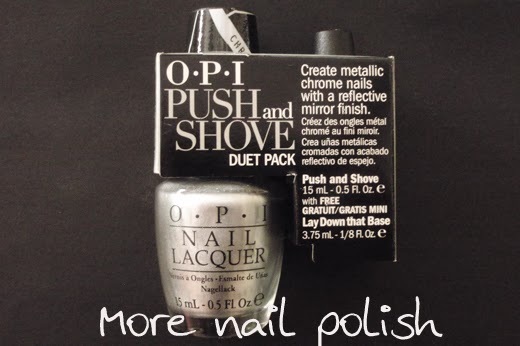 The OPI is also a much thicker polish, you can pretty much get away with one coat. Layla on the left, OPI on the right. In different lightling, it's much harder to see the difference between the two polishes. Of course, I also did a stamping test. It found the polish difficult to stamp with, I had to work quickly so it didn't dry on the plate, but then I had to time it right in stamping onto the nail too. If I stamped too quickly the polish would blur and smear out, if I waited too long it wouldn't transfer well onto the nail. The finish on the nail is fantastic, but I just couldn't get a clean edge. I'm sure more skilled stampers will get it to work much better than me. I'm a big fan of all things shiny, so I really love this polish. It's not 100% unique, but it is certainly executed extremely well. I think this polish will be very popular. What I really want to see now is a whole collection of different colours in this finish, and not wishy washy pastels, but strong bright reds, greens, golds and blues. Available in January where all OPI products are sold. I'm so in love with the Layla Chromes already that this is a definite win for me! So pretty! I apply a ridge filler underneath the laylas, so that might work if you're mini bottle is ever empty. Wait, you use PP Revolution as a top coat? I thought it can be used only as a base. PP Revolution is an awesome top coat over nail foils and it doesn't cause wrinkling, that's why I tried it over this too. I usually put seiche cite over it too. Thank you for the tip, I'll try it this way! That finish! Seriously, just incredible. Thanks for the full application review as well! I love my Laylas but the big plus for this OPI is being able to use a top coat without an appreciable difference whereas the Layla dulls out considerably with top coat. 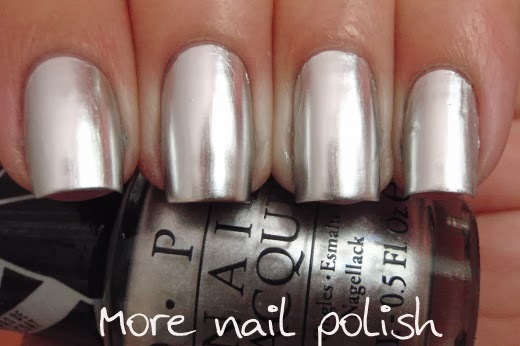 Thanks for showing the polish with the top coats - like I said - great review. My wallet is happy, this isn't one that will make the wishlist ;-). But, I do love how smoooooth your nails look with this. This looks just like Maybelline Mirror Image. That was sold in a two-pack with an aqua base-type polish as well. 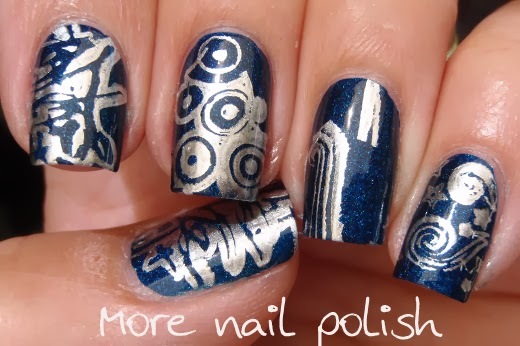 I thought this would be great for stamping - that's it, but how many silver foils can a girl have?????????????? Just got that little Push and Shove kit yesterday, and topped the application with the very glittery polish In True Stefani Fashion. It came out excellent, and so far, not even one chip!